Bio-aerosol is an emerging pollutant of the technological age. Air pollution related episodes that are a region-specific phenomenon in our atmosphere, with bio-aerosols being the main area of the problem. The present research was focused on assessing the particulate, and culturable concentration of bacteria at five different spatially located sites in the Rajkot city and surroundings, in the western part of India. The highest (108.33 × 109 CFU m−3) and lowest (318 × 103 CFU m−3) bacterial concentrations were found in dump site and residential area, respectively. With reference to particulate concentration, higher (101.79 ± 8.09) concentrations were reported in the industrial area than other sampling locations. All sampling sites under the present study displayed greater variability of bacteria than that of particle concentration. The growth potential of various bacterial isolates from perspective bioaerosol was measured spectroscopically by measuring OD at 600 nm in rich medium. The isolate 1A displayed significantly higher growth compared to all other isolates after 24 h. Outcomes of the current work suggested that bacterial concentration was observed in the respirable fraction (< 2.5 μm) and so had the potential to penetrate the deeper part of the lungs. In addition, meteorological parameters (i.e., wind speed, temperature, and relative humidity) were measured to understand whether they had any effect on biotic matter. The temperature and relative humidity are the most important meteorological parameters responsible for the enhanced viability of bacteria. Land use and land cover feature were also studied to understand the spatial characteristics of bio-aerosol in the study area. 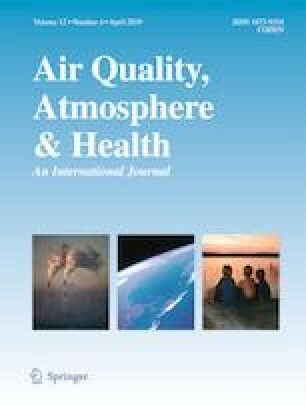 This viewpoint summarizes available information on bio-aerosols and its impact on human health, devising strategies to understand characteristics of bio-aerosols and emphasizing the vital gaps in available knowledge such as to develop a relationship between biological agents and solid/liquid or a mixture of both to the assessment of dispersion behavior and toxicological nature during exposure. Marwadi University, Rajkot, Gujarat, India provided us the required funding and support during fieldwork and analysis.